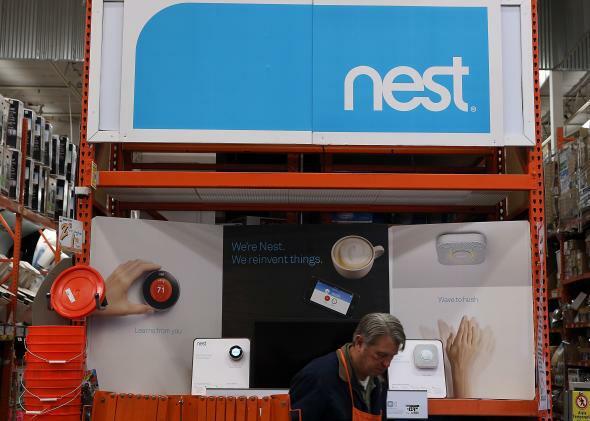 Google Nest acquisition: Internet of things is next frontier for data, machine learning. Google Doesn’t Care About Your Thermostat. It Wants to Organize the Internet of Things. Google has conquered the Internet of words. Now it’s taking aim at the Internet of things. Much of the initial reaction to Google’s $3.2 billion purchase of Nest, the startup behind a popular home thermostat and smoke alarm, has been of the fear-and-loathing variety. The worry is that Google will use Nest’s devices as a sort of Trojan horse to gather ever more data on its users and their habits—and perhaps even flood their homes with targeted advertisements. The cynicism is not wholly unwarranted. Broadly, Google is in the business of teaching machines to make sense of the world. In fact, though, the overwhelming majority of its revenue so far has come from teaching them to make sense of us—humans—and, in particular, our preferences and buying habits. As a rule, it’s safe to assume that any data Google can collect might ultimately be used to refine its algorithms in one way or another, and advertisements could someday be a part of that. But I don’t actually think Nest’s data is the main goal of this acquisition—at least, not any data that it has or is capable of collecting on users today. My former colleague Farhad Manjoo asked an astute question: Is there any significant data that Google can get on you with Nest that it can’t with Android phones? My answer: probably, but not $3.2 billion worth. Rather, the value of Nest for Google is as a point of entry to what may be the Internet’s next big frontier—the Internet of things. Google’s stated mission is to organize the world’s information and make it universally accessible and useful. It has done that, with incredible success, with regard to the existing Internet—the Internet of email and websites, of words and ideas. But it’s becoming increasingly clear that a growing amount of the world’s information is going to start coming, not from humans creating content, but from physical objects, including home appliances. They’re going to be communicating with your smartphone, with one another, and maybe in some cases with the wider Web. The companies that make those appliances, from Qualcomm and Cisco to Samsung and Whirlpool, have already begun trying to work out the frameworks that govern how they’ll interact. Google very dearly wants to be a part of that conversation. Until now, though, none of those appliances were made by Google. Now, one is. And it’s a good bet that more will be in the years to come. I don’t read that as saying that Nest will never share data of any kind with Google, no matter what. As veteran Google watcher Danny Sullivan told the New York Times, “History has shown that privacy policies do change. … They won’t hand over Nest data to Google, and Google mines it for whatever they want, but there could be incentives or reasons why it might make sense to tie it to a Google account.” But I do read it as yet another indication that Nest is more than just a tool for Google to gather more of your personal preferences for targeted ads. It’s playing a much longer game here. The data that smart appliances collect, analyze, and share is of a different kind than the data Google collects on you from your browsing habits, and it’s likely to have different applications. One that comes readily to mind is Google Now, the personal-assistant software that Google is developing for its Android devices. One can imagine Google Now recognizing that you’re headed home from work on a cold day—and telling Nest to turn up the heat so it’s nice and toasty when you arrive. That’s just one example of a way that Google could encourage users to share their Nest data voluntarily with Google’s own servers, without infringing on the privacy of Nest users who just want a snazzy thermostat. Again, though, it would be a mistake to think of Nest simply in the context of Google’s existing products. Nest’s products represent a new realm for the company in their own right—and as with Google’s recent robotics acquisitions, I doubt that even Google knows yet exactly how they will evolve. Google Just Bought Nest, the “Smart Thermostat” Company. Think Jetsons.